Pigeons, Crows, Sparrows, Seagulls, Starlings, Grackles, Cormorants, Small Animals, Rodents and more. Gardens, Parks, Golf Courses, Marinas, Rooftops, Warehouses, Docks, Farms & Barns, Storage Areas, Patios and other open areas. The most realistic decoy on the market with a scale size body, accurate markings of the Great Horned Owl and a wing span of nearly four feet with patented flapping wings. Without movement, an owl scare is useless – don’t be fooled by imitations that are immobile! The lightweight wings flap up and down in the breeze for an intimidating, realistic affect that birds and rodents desperately try to escape from. The Prowler Owl is splayed out in a permanent "hunting" posture with its wings out wide and its head looking down as if searching for prey. Birds and rodents recognize this predator position and flee to other areas. 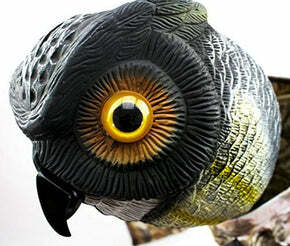 Install Prowler Owl decoy in any open outdoor area where pest birds or small critters are a problem. The owl head is made of a hard plastic resin, and the body/wings are extra-durable, waterproof non-woven fabric supported by flexible cables and riveted plastic struts. Dimensions Wingspan: 44", Length: 28" head-to-tail, Head Diameter: 7"
Materials Replica owl Head is hard resin plastic, body is strong-weave iron hide fabric supported by woven flexible cables and riveted plastic struts. California Prop 65 Warning This product contains DEHP phthalate, a chemical known to the state of California to cause birth defects and other reproductive harm.